Where seen? 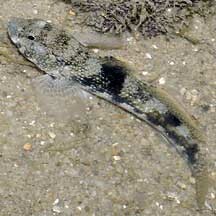 This pretty spotted goby is commonly seen on many of our shores, in rocky shores, coral rubble and reefs. Features: 4-7cm long. It has bulging cheeks and a pattern of tiny white spots regularly spaced on its face and in rows down its body. Usually a pair of dark saddles, as well as dark blotches. 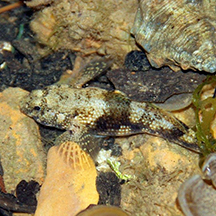 The most commonly seen frill-fin gobies on our shores are the Common frill-fin goby (Bathygobius fuscus) and Meggitt's frill-fin goby (Bathygobius meggitti) which look very similar. and in rows on its body. Photo shared by Jonathan Tan on facebook. Photo shared by Marcus Ng on facebook. Photo shared by Liana Tang on her blog. Thanks to Dr Zeehan Jaafar for identifying some of these fishes. Common frill-fin goby (Bathygobius fuscus) Lim, Kelvin K. P. & Jeffrey K. Y. Low, 1998. A Guide to the Common Marine Fishes of Singapore. Singapore Science Centre. 163 pp. 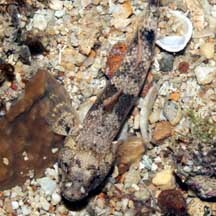 Dusky frillgoby (Bathygobius fuscus) and Meggitt's goby (Bathygobius meggitti) from FishBase: Technical fact sheet. Bathygobius fuscus on the IUCN Red List. Larson, Helen K and Kelvin K. P. Lim. 2005. A Guide to Gobies of Singapore. Singapore Science Centre. 164pp.